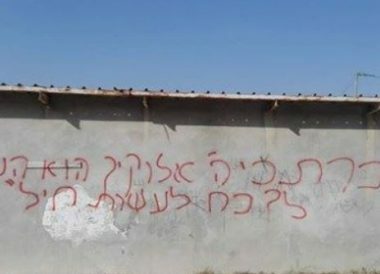 A group of extremist Israeli colonizers invaded, on Thursday at dawn, the village of Orif, south of the northern West Bank city of Nablus, wrote racist graffiti, and punctured the tires of many parked cars. Ghassan Daghlas, a Palestinian official who monitors Israel’s illegal colonialist activities in northern West Bank, said the assailants came from Yitzhar colony, which was illegally built on private Palestinian lands. Daghlas added that the assailants invaded the northern area of the town, before writing racist graffiti and puncturing the tires of many cars.